It’s spring now in London, days are longer, the light is beautiful and the first colours have arrived. To me, the most special of these is the Daffodil. An understated flower that glows yellow at the start of spring and has such a short life. It signals the way, acts alone and starts the onslaught of colour that follows throughout the remainder of spring and summer. I sat the otherday with a cup of peppermint tea right next to a daffodil and I wondered how something so simple and beautiful knows that it is time to arise, time to be the best it can, time to realise its potential. Spending 11 months of the year underground, its one month of beauty is always perfectly timed. I decided it was time to spend time with my beautiful new friend, I wanted somehow to understand him (for I have decided he is a he) what might be going on for my daffodil friend. 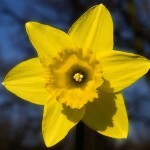 I always wondered why sometimes daffodils bloom as early as february and other years as late as april. They seem somehow to know when to bloom, accepting a wide range of parameters such as temperature, daylight, ground conditions and rain. To be so beautiful whilst being in harmony with what is around seemed a bit like a Free Mental Attitude to me. The daffodil does not bloom whenever it likes without regard to everything going on in its environment, nor does it bloom after analysing everything and seeing what has already happened in the summer. It gets it just right. I did a little research on google and found that my friend has a single gene that controls its blooming, this gene talks to other genes at the location of the potential bud and communicates information around temperature, quality of air, water content and then if everything is in harmony and empathy it initiates bloom. The bloom comes and goes so quickly, the beauty arrives with no fuss, no bother and almost as soon as it arrives it is gone. A beautiful article Nick. It is fascinating to follow plants at this time of the year. It is still too early for daffofils here in Norway, but in our window, we have planted tulips, which I go and greet every morning. I also follow very excitedly the development of my orchid, which has been without any flowers since october, and now a small bud has come! I was so happy when I discovered, like a child. the miracle of life!